The Advocate’s Dilemma is the fourth entertaining installment of The Advocate series by Teresa Burrell. Burrell’s main protagonist, Sabre Brown, is a dedicated child advocate attorney whose beat revolves around the San Diego Superior Court, Juvenile Division. At thirty-one, she’s both mother hen and fierce defender of her young abused and neglected wards, speaking for and defending them against their worst enemies that are sadly, in most cases, their own parents. Sabre’s hectic work life is suddenly thrown off kilter when she walks into her office and finds a man’s murdered body sprawled across her desk. She calls her best friend and fellow attorney, Bob, who identifies the body as that of George Foreman, his client in the juvenile dependency case where Sabre represents Foreman’s neglected children, Riley and Marcus. With Bob one of the few people with a set of keys to her office, he’s suddenly the prime suspect in the police’s subsequent investigation. A shaken Sabre immediately puts her other good friend, JP, an investigator who rounds out their closely-knit triumvirate, on the case but the three quickly discover that things aren’t exactly as they seem. By all accounts, the deceased and his wife, Dana, were addicts who had used their children to extort money from her parents for cash. Both boys are currently living with Dana’s parents, the wealthy Frank and Celia Davis. However, it soon becomes apparent when JP interviews Frank and Celia Davis that their take on the events as they occurred aren’t the same. Things get even more complicated when one of the boys, Marcus, is taken to the psych ward after attacking his grandmother one morning while muttering, “I know.” Sabre suspects that the young boy knows far more about his father’s death than he’s telling and with her friend, Bob, as the unlikely suspect in the father’s murder, they both need her help. The only problem is, how can Sabre help both of them without betraying her young charge? No two ways about it – The Advocate’s Dilemma deals with some tough subject matter. Abused and neglected children are not easy pills to swallow for any reader. Burrell knows this and treats the subject matter with both compassion and sensitivity. Her prose is light, the dialogue crisp and there’s a thread of humor throughout the story, which makes it an entertaining read rather than one that’s bogged down by its depressing subject matter. However, what really sells the story is the wonderful relationship between Sabre and her protagonist co-stars, Bob and JP. The sense of camaraderie, trust and friendship between these three characters highlights a well-executed plot. Burrell’s first-hand knowledge of the intricacies of the juvenile court system, thanks to her years as an attorney representing abused minors and juvenile delinquents, gives The Advocate’s Dilemma that extra stamp of authenticity, making it all the more engaging. A terrific read from start to finish. The Advocate's Dilemma: The Advocate Series, Book 4 is a legal thriller written by Teresa Burrell. Attorney Sabre Brown was stunned when she found a dead body draped across her office desk. Her six years of experience as a practicing attorney meant she knew not to touch anything once she had established that the man was indeed dead and not merely sleeping off a night on the town. While the police were conducting their investigation, Sabre was pleased to see her friend and fellow lawyer, Bob Clark, arrive. They began to coordinate their caseload to mitigate the impact of any delays Sabre would have due to the investigation in her offices. Sabre had never seen the poorly dressed victim before, but Bob quickly identified him as the husband of a young woman who was his client. She and the victim, George Foreman, were the parents of two young children who were being represented by Sabre in a juvenile dependency case. To complicate matters further, San Diego Police Detective Shane Klakken, who was working the case, and Sabre's private investigator and friend, JP Torn, have a troubled personal history. Teresa Burrell's legal thriller, The Advocate's Dilemma: The Advocate Series, Book 4, is an exciting and well-written work that blends the legal thriller and police procedural genres. While this is the fourth book in Burrell's The Advocate Series, the author provides more than enough background for this book to be read on its own; however, I've enjoyed each of the preceding books and recommend reading them as well. One of the things I appreciate about this book in particular, and the series in general is that the reader gets an authentic and genuine feel for the practice of family law, from the initial and ongoing investigations and interactions with social workers and clients through to the appearances in court. Sabre, Bob and JP are marvelous characters, and they've begun to feel like old friends. I'm looking forward to reading the next volume in this series. The Advocate's Dilemma is highly recommended. 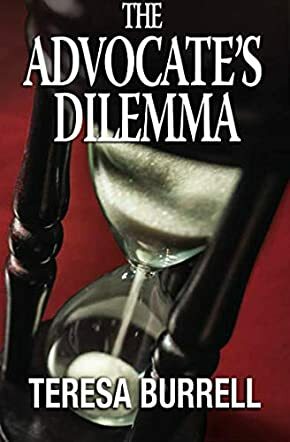 Teresa Burrell’s The Advocate’s Dilemma reveals the struggle of believing in and relying on the judicial system when friendship is on the line. Sabre Brown is an attorney and child advocate in San Diego, CA. She takes her job very seriously. One morning, Sabre enters her office to find a dead man lying on her desk. The victim is the father of Marcus and Riley, the juvenile clients she represents. Question after question arise about the case. Soon, the number one suspect for the murder is Sabre’s long time friend and work associate, Bob Clark. Who is framing Bob and why? JP, Sabre’s investigator, is determined to find out, despite the conflict with the San Diego PD. Sabre is put in a professional dilemma. To find out who killed George Foreman, she must choose between her young clients or her friend. The deeper the investigation goes, the greater the struggle of devotion. Discovering the reality of abuse her clients have endured haunts Sabre’s nights and days, ultimately forcing her to face the ugly truth – that when parents care more about their habit than their children, it is the children who pay for their weaknesses. And the children pay in unimaginable ways. The Advocate’s Dilemma is a tale of mystery and devotion. Although this was the first book in the Advocate series I have read, I was immediately enthralled by the sincerity of the story and its characters. Burrell has the ability to spotlight honor and justice in the midst of a horrific plot. The narrative is simply written with no unnecessary fluff or over-the-top graphic detail. However, Burrell throws in a few interesting metaphors (JP-isms), especially in shaping the “cowboy” character of JP. These one-liners add comic relief at pivotal times in the dialogue. The triune cast of characters centers on the protagonist, Sabre, her faithful confidante, Bob, and the somewhat reliable flat character of JP. JP, by the way, is a silent love of interest of Sabre’s, and this romantic undercurrent ripples throughout the plot development. The plot progresses page upon page, making it an intriguing and quick read. Burrell adds a few unexpected twists regarding the “whodunit” question, peaking the tempo in the rising action. I appreciate the author using her real life experience to write about child advocacy. The silent voice of the abused must be heard and remembered, and what better way than in stories that touch people's lives.